The Martin lab is physically located in the Forest Sciences Buiding on the Vancouver campus of The University of British Columbia, in Vancouver, BC, Canada. Our position within UBC is: TheDepartment of Forest Sciences in the Faculty of Forestry, but we are also part of the Centre for Applied Conservation Research (CACR), which is a collection of conservation researchers from several departments at UBC, as well as other universities in western Canada. There are currently 2 Doctoral students, 1 Masters student, and two Post-doctoral Fellows in the lab. 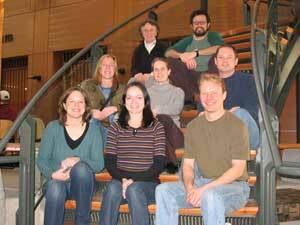 All lab students, and their projects, are listed on Kathy Martin’s faculty webpage, as well as the CACR webpages. Alice Boyle (post-doc) also has her own webpage. The Alpine projects. See Kathy’s Centre for Alpine Studies pages (“alpine home” in the blue menu bar above). “Nestweb” is a project studying cavity nesting community ecology in the area of Williams Lake, BC, Canada. Since the project started in 1995, we have found and monitored 3183 nests from 35 species of cavity nesters, which were created by 13 species of primary cavity excavator plus naturally occurring holes. Click here for more information. In 2006, we started a related project studying the avian cavity nesters of the Atlantic Forest, in Argentina. Click here for more information.